The aperitif was Antinori’s Franciacorta—Tenuta Montenisa, Cuvée Royale, elegant and flavorsome. There’d been a bit of frost there, said Piero, when the temperature dipped all over Europe in early May, though the Tuscan estates seemed to have survived unscathed. 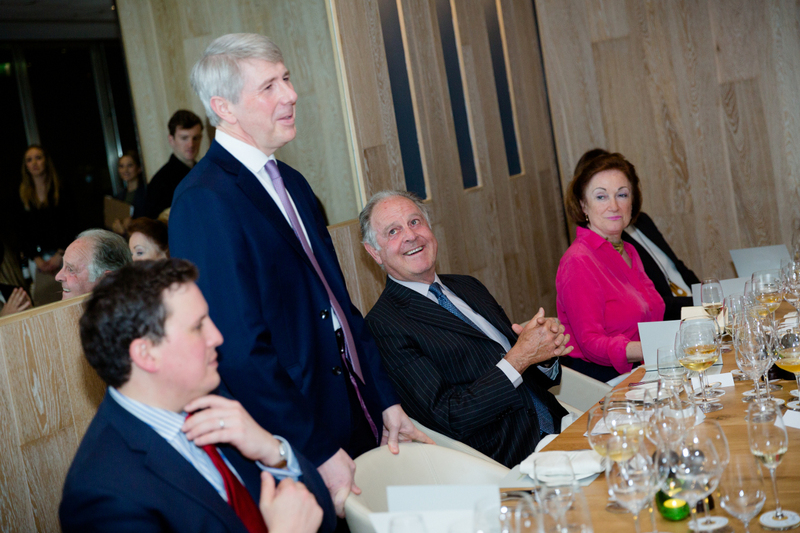 On the evening of our dinner in London the weather had changed to pouring rain, though guests shrugged off the climate (poor Piero had left Pisa in bright sunshine) and settled down to an evening of perfectly judged food and wine matches. Theo Randall’s style is of simple, unfussy Italian dishes—stylish food that doesn’t need to show off. That was the key to the evening. As was appropriate, the food bowed to the wine. This may seem obvious, but some of the worst car-crash combinations I have endured have been at the hands of chefs who decline to temper their dishes to the wines they have been asked to match. Sometimes, of course, it’s a challenge. Say you had to suggest a dish for a young white wine with distinct oak influence, and also a mature white of great silkiness. One is going to work better than the other. 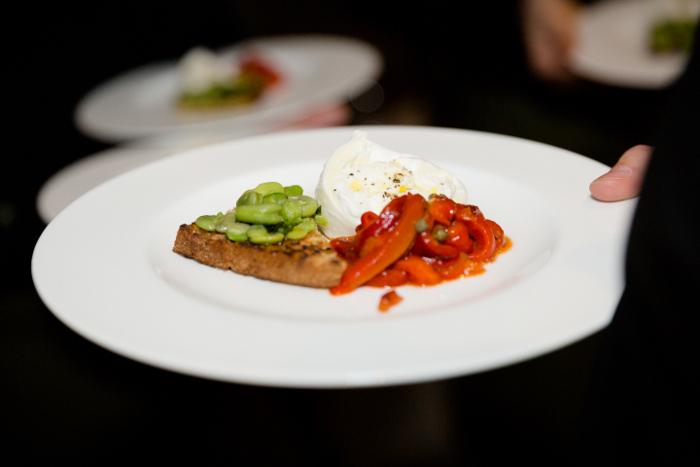 The chef’s solution was fresh burrata with broad beans, bruschetta, and roasted red peppers; the 2014 vintage of Cervaro della Sala, tense, bright, and lemony-leafy, bounced off it a little—or at least the oak did—but with the 2005 vintage a transformation had been effected, and the oak had sunk gracefully into the wine and been subsumed into nuts, butter, and lemon, still very fresh and taut, but winier, and more amenable to food. The blend of Cervara della Sala is Chardonnay with 20% Grechetto because, says Piero, “Chardonnay in Umbria tends to lose acidity, and Grechetto has lots of acidity.” The oak is always the same, mostly Limousin, and there’s some bâtonnage; and it does age well. The first vintage, 1988, is still “interesting,” says Piero. And of the two years we were tasting, 2005 was rather cold and rainy, and 2014 also problematic; they were a lesson in why you shouldn’t look only at the most highly rated years. Badia a Passignano is Chianti Classico, of course, from a rocky, hilly site that is difficult to cultivate; it’s 100 percent Sangiovese, and the 2001 and 2012 were paired with carne salata: thinly sliced beef, rocket, pine nuts, and parmesan. Without food the 2012 showed off its freshness and elegance: it’s full of tobacco and graphite notes, linear and aromatic, with tea and roses. The 2001, from a hot year, seemed chunkier and less elegant; still young but a bit of a bruiser compared to the more intellectual 2012. One guest pointed out the clear family resemblance nevertheless; well, families are like that, the Antinoris included. But even awkward family members can become more tractable with food, and so it was with the 2001, which turned positively silky when given some beef to deal with. “It has a softness less typical of Chianti Classico,” said Piero. “Twenty to 25 years ago the problem in Chianti Classico and Sangiovese was low sugar,” confirmed Piero. “We had to add concentrated must, since we are not allowed to chaptalize. The color was light and the structure was weak. Now it’s the opposite. Alcohol is too high. It’s often 14.5%–15%, which for me is too much, but if you want phenolic maturity you get this. Today Chianti Classico is better than 25 to 30 years ago. A bit of that is the influence of climate change, but the other reason is lower yields per hectare. “Sangiovese is very sensitive to quantity. Quality goes down faster than in other varieties, with higher quantity.” In the end, he says, the solution is probably to move to higher elevations and different exposures—northeast, for example. “Lightness is important,” said someone else. “Beaujolais—I’ve been buying Beaujolais. Am I allowed to say that? All the crus are so different.” Was that how the subject of “Burgundian viticulture” came up? It’s become a bit of a buzzword, with some producers claiming Côte d’Or levels of detail when they just mean they treat their different plots a bit differently. It’s a phrase often best taken with a pinch of salt. Could it be done in Chianti Classico, with or without salt? The crystalline texture, the savory, bright, crunchy spice and tea and cherry flavors of the 2013, and the aromatic fennel and leather, the taut finesse of the 1999, both went brilliantly with cappelletti vitello stuffed, as the name might suggest, with veal, pancetta, and porcini. The acidity and tannin of the younger wine cut through the richness of the dish, and the older wine just felt secure with it: which you preferred was purely personal, and votes seemed evenly divided. Guado al Tasso is a darker, beefier proposition, the 2013 rich and dense, full of cherry fruit and a touch of alcoholic warmth, with silky, ripe tannins; the 2007 more graceful, more aromatic and sinewy. With it we had costata di agnello—rack of lamb roasted pink with tiny leeks, fennel, carrots, beetroot, turnips, and salsa d’erbe: a gift to any red wine. From there to Solaia, which is the mirror image of Tignanello: 80 percent Cabernet, 20 percent Sangiovese. “It’s from a specific vineyard of six hectares, contiguous to Tignanello. The Cabernet was planted for Tignanello but in excess, so we made it separately and in 1978 we released it as Solaia. I still have some 1978; it’s still showing very well. We drank the 1994 (from magnum) and the 2011 with cheese. The younger wine is all aromatic fruit, mint and roses, dense and tightly knit, with notes of cloves and sweet spice, balsamic and rosemary flavors stitched through concentrated cherry fruit; the older wine is savory, with thyme, tobacco, leather, and garrigue, aromatic, layered, and elegant. “It has plenty of potential for further aging,” said Piero.